Growths on or around the eyelids and face are common. The eyelid is an extremely common site of skin cancer accounting for up 10% of the more than 5 million cases diagnosed each year. The vast majority of eyelid and facial lesions are benign and we are able to remove them easily and comfortably right in the office. The approach to early detection, diagnosis and treatment of growths on the eyelids and face is similar to elsewhere on your body. Changes in appearance, size or color are all considered important to bring to our attention. Sometimes a quick and relatively simple in office biopsy procedure may be required to determine whether the lesion is problematic. Should the growth in question be malignant, we may remove it or, depending on the type of malignancy, the breadth and depth, ask that a dermatological oncologist perform a MOHS Micrographic Surgery after which we will perform a reconstructive surgery to create a proper cosmetic result for you. There are several types of malignant growths of the eyelid and face that we want to observe and identify. By far, the most common malignant or cancerous growth of the eyelid is known as basal cell carcinoma. This is most typically a very slow growing malignancy that may be present for several months before it is recognized. This cancer rarely spreads to other parts of the body, but it does require removal and reconstruction. We will perform an evaluation of any abnormal growth of the face and eyelids and will possibly recommend an in office biopsy. Should the biopsy specimen be read by the pathologist as positive for malignancy, further management will be required. This may include a simple office procedure or may require more extensive removal and reconstruction in a hospital using light sedation to help keep you comfortable. If this is done in the hospital, frozen sections will be taken of the margins of the lesion. These specimens will be sent to the pathologist while we await the report. When all abnormal tissue has been removed, we will reconstruct the affected area. This may require simple closure with sutures, or it may require the use of skin grafts or flaps. 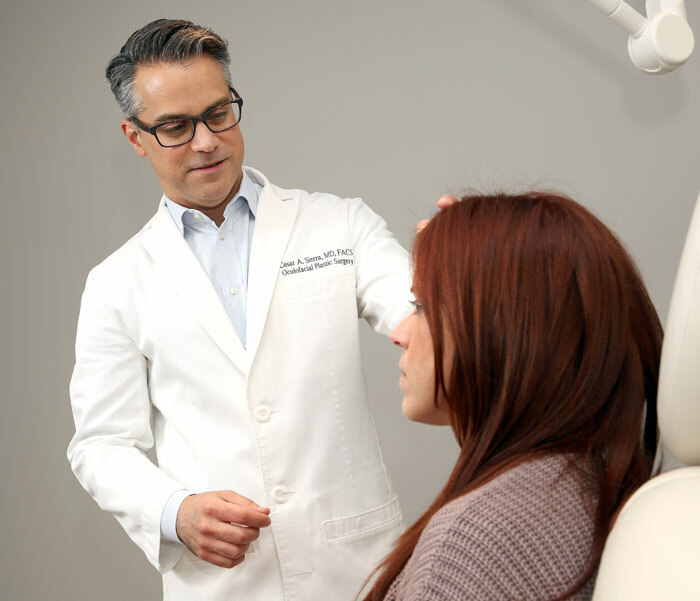 As a reconstructive and cosmetic facial plastic eye surgeon, Dr. Sierra has considerable experience in repairing defects from the smallest to very extensive reconstruction if needed. Once the tumor is removed completely, we will generally keep you under observation yearly over the next several years. It is unlikely that the tumor will recur or cause further problems, but once you have a single basal cell, it is certainly more likely to have others in the coming years. Generally, patients do extremely well and most patients who undergo resection and reconstruction of a basal cell carcinoma can have no residual cosmetic deformity. Like basal cell carcinoma, this is a relatively slow growing cancer. It does however, have a greater potential to locally invade, as well as metastasize. It can also travel along nerve roots and therefore, can often present with pain. Fortunately, it is much less common than basal cell cancers. It is managed in the same way as a basal cell cancer, although a wide excision may be required. It is also generally dealt with more promptly than a basal cell cancer. Sebaceous cell adenocarcinoma is exceedingly rare, but it is most specific to the eyelids. It can clinically mimic several other benign problems of the eye and it is therefore misdiagnosed or diagnosed after delay. It most frequently occurs in patients in their 70’s and 80’s but can occur at any age. It is serious in the sense that it has metastatic potential. Diagnosis is often difficult even when an adequate specimen is obtained and sent for pathologic evaluation. Again, as a reconstructive and cosmetic facial plastic eye surgeon Dr. Sierra has extensive experience in diagnosing, managing and treating patients with sebaceous cell adenocarcinoma. Like other parts of the body, an abnormal coloration to the skin can represent a melanoma or something along the spectrum of a melanoma. While eyelid and facial melanomas are rare, any pigmented lesion around the eyelid deserves attention. Similar guidelines to pigmented lesions or moles on other parts of the body, certainly apply to the eyelids. Changes in color, size and behavior all warrant evaluation and possible biopsy. To learn more and get help for early diagnosis, treatment and eyelid reconstruction for eyelid skin cancers or lesions, schedule a consultation with Cosmetic Eyelid & Reconstructive Eye Plastic Surgeon Cesar Sierra, M.D.